In an office in the city somewhere, Casey Jones, private eye, is standing behind his desk, pondering how funky the city can be. Just then, a ravishing yet familiar dame walks in. She asks if he’s heard the news, and he has: the Slaughter Dogs, a ruthless gang Casey helped put away, have just busted out of jail. She asks what Casey intends to do. He intends to take her for a night on the town. Detective Jones’s “night on the town” turns out to be a trip to the seediest pool hall in the city. Just as things start to get “romantic”, the Slaughter Dogs drive their truck through the side of the building. 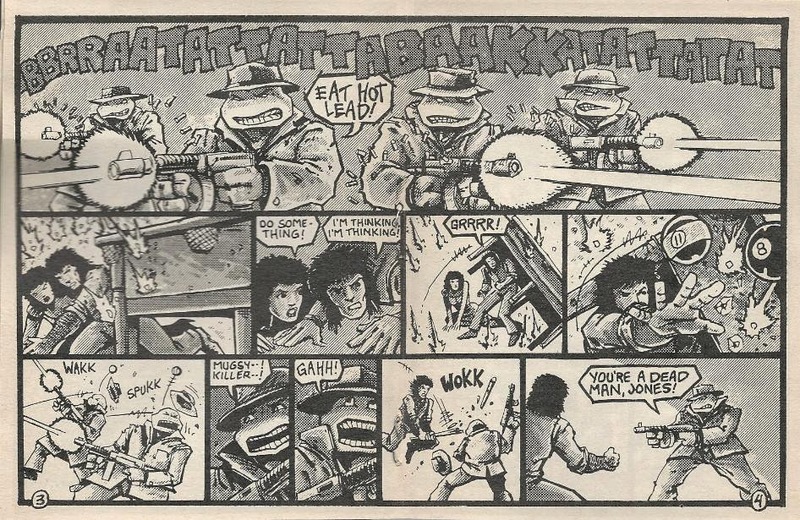 The Slaughter Dogs just so happen to be giant Turtles in trench coats and fedoras, wielding tommy-guns. The Slaughter Dogs open fire and Casey, grabbing his gal, ducks for cover behind a pool table. Thinking fast, he knocks over the table for extra cover, then hurls a pair of billiard balls at the Slaughter Dogs, knocking out “Mugsy” and “Killer”. Grabbing a cue, Detective Jones then proceeds to lay a third Slaughter Dog out cold. The last remaining Slaughter Dog prepares to gun Casey down, only to discover he’s out of ammo. The pair then engage in a fist fight, with Detective Jones on the losing end. All hope seems lost until the dame smashes a bottle over the Turtle’s head. With the Slaughter Dogs all down for the count, the police finally arrive and Detective Jones hands the hoodlums over to the Police Sergeant. Giving his gal a smooch, Jones walks off into the night. However, before things can get really good, April and one of the Turtles wakes Casey up from his pleasant dream. Apparently, he fell asleep while watching “Dirk Bolt, Detective” on TV. April tells Casey to come help her clean out the barn like he promised while the Turtle chides him for being such a lazy couch potato. Casey just sighs that reality’s a real bummer. *For my money’s worth, I like to place this story just before TMNT (Vol. 1) #14, “The Unmentionables”, as both share the common “Casey-as-old-fashioned-detective” themes. The Mirage Mini Comics Collection was an interesting if badly overpriced experiment. The contents are extremely hit and miss, but some genuinely good nuggets managed to gleam through. Among them was this forgotten little short, “Casey Jones, Private Eye”. At eight pages, it’s really nothing more than a gag piece, but a fun divergence nevertheless. It actually segues into “The Unmentionables” rather nicely, what with it taking place in Northampton and all, not to mention the overarching theme of Casey wanting to be an old school detective. I think it’s more fun than “The Unmentionables”, honestly, which was a story I never much cared for. 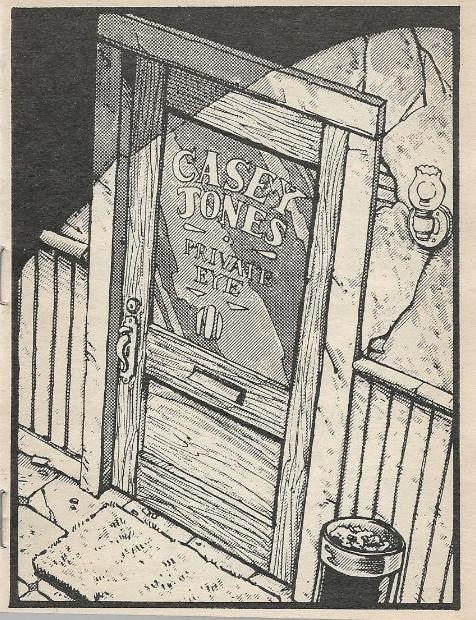 “Casey Jones, Private Eye” executes the joke much better, which really only had about eight pages-worth of potential in it, anyway. It’s amusing to see Casey trying to talk in old school detective lingo but butchering it with his meager intellect, not to mention seeing how he casts his friends in his own little “movie”. Of the three Turtles stories published in the Mirage Mini Comics Collection, “Casey Jones, Private Eye” is the only one I really like. “A Forgotten TMNT Adventure” is nothing but more of Stephen Murphy’s tedious eco-preaching, while “Lasagna Loves” isn’t really much of a TMNT story. Anyhow, hit and miss though the collection is, I’d recommend it to fans of Mirage comics in general, though perhaps not fans only of TMNT. Just don’t pay more than cover price for it, since even $12 bucks is really pushing its value, considering the incredibly cheap presentation.